Semifreddo is an Italian semi-frozen ice cream dessert. 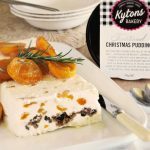 This simple recipe is the perfect way to enjoy Kytons award winning Traditional Christmas Pudding with Custard on a hot Australian Christmas day. Place the dried apricots, brandy, 1/2 cup of caster sugar and rosemary sprig into a small saucepan. Bring to the boil, then reduce the heat and simmer for 5 minutes. Set aside to cool. Line a 20x10cm loaf tin with aluminium foil and then baking paper making sure to extend over the sides for easy removal. In a large bowl, beat the egg whites until they are very stiff. In a separate bowl, beat together the yolks and remaining caster sugar until pale and thickened. In a third bowl, beat the thickened cream until stiff peaks form. Gently fold the yolk mixture into the egg whites until just combined, and then gently fold the egg mixture through the whipped cream until well combined. Remove the dried apricots from the syrup (reserving the syrup) then finely chop the dried apricots and stir them through the custard cream. Carefully pour two thirds of the custard cream into the prepared loaf pan. Evenly scatter the Kytons Christmas pudding crumbs into the tin and then carefully pour over the remaining custard cream. Fold up the sides of the foil and baking paper to completely enclose the semifreddo and then cover completely with cling film (to help avoid freezer burn) then place the tin into the freezer for at least 6 hours or overnight. Meanwhile, place the fresh apricot halves into a frypan with the leftover brandy syrup. Cook together for 2-4 minutes depending on ripeness, until tender but still holding their shape. Set aside until ready to serve. To serve - Remove the fully frozen Semifreddo from the freezer, slice into 10 even pieces or place the whole semifreddo onto a serving plate. Leave at room temperature for 5 minutes before serving with the brandied Apricots and an extra drizzle of syrup. Tip: This is a fantastic dessert to make ahead of time. You can complete the recipe up to step 6 and it will keep well in the freezer for up to a week. Complete steps 7 and 8 on the day of serving.